Akhenaten (r. 1353-1336 BCE) was a pharaoh of Egypt of the 18th Dynasty. He is also known as `Akhenaton’ or `Ikhnaton’ and also `Khuenaten’, all of which are translated to mean `successful for’ or `of great use to’ the god Aten. 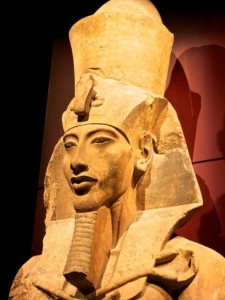 Akhenaten chose this name for himself after his conversion to the cult of Aten. 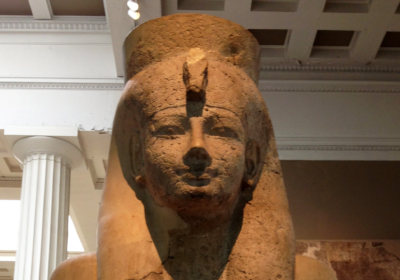 Prior to this conversion, he was known as Amenhotep IV (or Amenophis IV). He was the son of Amenhotep III (1386-1353 BCE) and his wife Tiye, husband of Queen Nefertiti, and father of both Tutankhamun (by a lesser wife named Lady Kiya) and Tutankhamun’s wife Ankhsenamun (by Nefertiti). His reign as Amenhotep IV lasted five years during which he followed the policies of his father and the religious traditions of Egypt. However, in the fifth year, he underwent a dramatic religious transformation, changed his devotion from the cult of Amun to that of Aten, and, for the next twelve years, became famous (or infamous) as the `heretic king’ who abolished the traditional religious rites of Egypt and instituted the first known monotheistic state religion in the world and, according to some, monotheism itself. 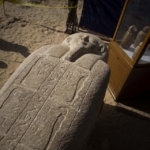 His reign is known as The Amarna Period because he moved the capital of Egypt from the traditional site at Thebes to the city he founded, Akhetaten, which came to be known as Amarna (also Tell el-Amarna). The Amarna Period is the most controversial era in Egyptian history and has been studied, debated, and written about more than any other. Amenhotep IV may have been co-regent with his father, Amenhotep III, and it has been noted that the sun-disk known as the `Aten’ is displayed on a number of inscriptions from this period of the earlier king’s reign. The Aten was not new to the rule of Akhenaten and, prior to his conversion, was simply another cult among the many in ancient Egypt. It should be noted that `cult’ did not have the same meaning in this regard as it does in the present day. There was absolutely nothing negative in the designation of a community of worshippers being known as a `cult’ in ancient Egypt. It carried the same meaning then as a member of the Christian community today being designated a Baptist, a Lutheran, a Presbyterian, or Catholic or Eastern Orthodox. The gods and practices of the various cults all represented the same end: eternal harmony and balance. AKHENATEN’S RELIGIOUS REFORMS MAY HAVE BEEN THE FIRST EVER INSTANCE OF MONOTHEISM. Amenhotep III ruled over a land whose priesthood, centered on the god Amun, had been steadily growing in power for centuries. By the time Amenhotep IV came to power, the priests of Amun were on almost equal standing with the royal house in wealth and influence. The historian Lewis Spence writes, “With the exception of Ra and Osiris, the worship of Amun was more widespread than that of any other god in the Nile Valley; but the circumstances behind the growth of his cult certainly point to its having been disseminated by political rather than religious propaganda” (137). By the time of Amenhotep IV, the Cult of Amun owned more land than the king. In the 5th year of his reign, Amenhotep IV outlawed the old religion and proclaimed himself the living incarnation of a single all-powerful deity known as Aten and, by the 9th year, he had closed all the temples and suppressed religious practices. Amenhotep IV moved his seat of power from the traditional palace at Thebes to one he built at the city he founded, Akhetaten, changed his name to Akhenaten, and continued the religious reforms which resulted in his being despised as `the heretic king’ by some later writers while admired as a champion of monotheism by others. Some historians have praised Akhenaten’s reforms as the first instance of monotheism and the benefits of monotheistic belief; but these reforms were not at all beneficial to the people of Egypt at the time. The historian Durant, for example, writes that Akhenaten’s reforms were “the first out-standing expression of monotheism – seven hundred years before Isaiah [of the Bible] and an astounding advance upon the old tribal deities” (210). Those `old tribal deities’ of Egypt, however, had encouraged peace, harmony, and the development of one of the greatest ancient cultures the world has ever known. The polytheism of the ancient Egyptians encouraged a world view where peace and balance were emphasized and religious tolerance was not considered an issue; there is not even a word directly corresponding to the concept of `religious tolerance’ in the ancient Egyptian texts. A hallmark of any monotheistic belief system, however, is that it encourages the belief that, in order for it to be right, other systems must necessarily be wrong. This insistence on being the sole arbiter of ultimate truth leads to intolerance of other beliefs and their suppression; this is precisely what happened in Egypt. The names of the god Amun and the other gods were chiseled from monuments throughout Egypt, the temples were closed, and the old practices outlawed. Priests of Amun who had the time and resources hid statuary and texts from the palace guards sent to destroy them and then abandoned their temple complexes. Akhenaten ordained new priests, or simply forced priests of Amun into the service of his new monotheism, and proclaimed himself and his queen gods. The pharaoh as a servant of the gods, and identified with a certain god (most often Horus), was common practice in ancient Egypt but no one before Akhenaten had proclaimed himself an actual god incarnate. As a god, he seems to have felt that the affairs of state were beneath him and simply stopped attending to his responsibilities One of the many unfortunate results of Akhenaten’s religious reforms was a neglect of foreign policy. From documents and letters of the time it is known that other nations, formerly allies, wrote numerous times asking Egypt for help in various affairs and that most of these requests were ignored by the deified king. 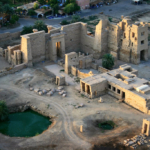 Egypt was a wealthy and prosperous nation at the time and had been steadily growing in power since before the reign of Queen Hatshepsut (1479-1458 BCE). Hatshepsut and her successors, such as Tuthmosis III (1458-1425 BCE), employed a balanced approach of diplomacy and military action in dealing with foreign nations; Akhenaten chose simply to largely ignore what happened beyond the borders of Egypt and, it seems, most things outside of his palace at Akhetaten. Watterson notes that Ribaddi (Rib-Hadda), king of Byblos, who was one of Egypt’s most loyal allies, sent over fifty letters to Akhenaten asking for help in fighting off Abdiashirta (also known as Aziru) of Amor (Amurru) but these all went unanswered and Byblos was lost to Egypt (112). Tushratta, the king of Mitanni, who had also been a close ally of Egypt, complained that Amenhotep III had sent him statues of gold while Akhenaten only sent gold-plated statues. The famous Stele of Akhenaten, depicting the royal family, shows the rays of the Aten touching them all and each of them, even Nefertiti, depicted with the same elongation as the king. To consider these images as realistic depictions of the royal family, afflicted with some disorder, seems to be a mistake in that there would be no reason for Nefertiti to share in the king’s supposed disorder. The depiction, then, could illustrate Akhenaten and Nefertiti as those who had been transformed to god-like status by their devotion to the Aten to such an extent that their faith is seen even in their children. One aspect of Amarna Period art which differentiates it from earlier and later periods is the intimacy of the images, best exemplified in the Stele of Akhenaten showing the family enjoying each other’s company in a private moment. Images of pharaohs before and after this period depict the ruler as a solitary figure engaged in hunting or battle or standing in the company of a god or his queen in dignity and honor. 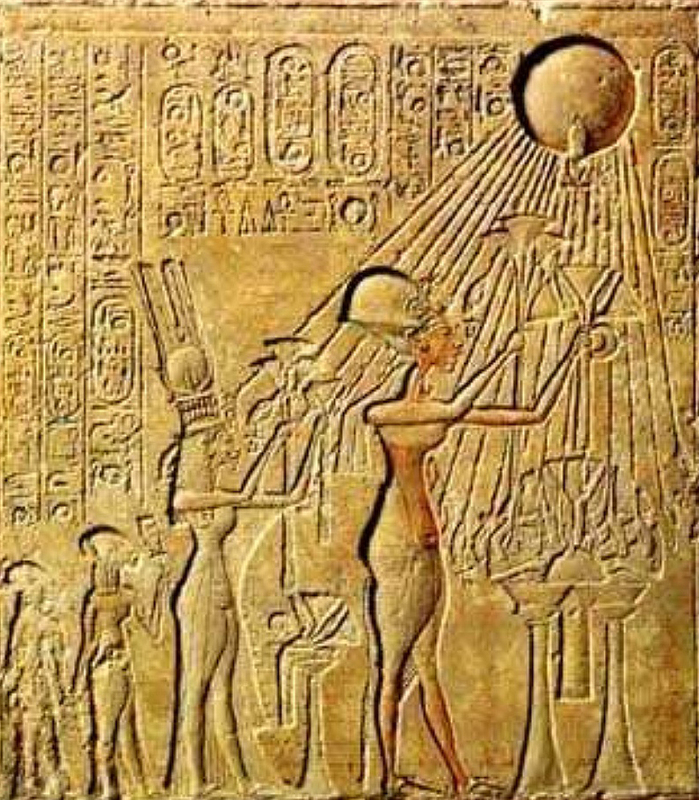 This can also be explained as stemming from Akhenaten’s religious beliefs in that the Aten, not the pharaoh, was the most important consideration (as in the Stele of Akhenaten, it is the Aten disk, not the family, which is the center of the composition) and, under the influence of the Aten’s love and grace, the pharaoh and his family thrives. This image of the Aten as an all-powerful, all-loving, deity, supreme creator and sustainer of the universe, is thought to have had a potent influence on the later development of monotheistic religious faith. Whether Akhenaten was motivated by a political agenda to suppress the power of the Cult of Amun or if he experienced a true religious revelation, he was the first on record to envision a single, supreme deity who cared for the individual lives and fates of human beings. Sigmund Freud, in his 1939 CE work Moses and Monotheism, argues that Moses was an Egyptian who had been an adherent of the Cult of Aten and was driven from Egypt following Akhenaten’s death and the return to the old religious paradigm. Freud recognizes that the Cult of Aten existed long before Akhenaten raised it to prominence but points out that Akhenaten added a component unknown previously in religious belief: “He added the something new that turned into monotheism, the doctrine of a universal god: the quality of exclusiveness” (24). The Greek philosopher Xenophanes (c. 570-c.478 BCE) would later experience a similar vision that the many gods of the Greek city-states were vain imaginings and there was only one true god and, though he shared this vision through his poetry, he never established the belief as a revolutionary new way of understanding oneself and the universe. 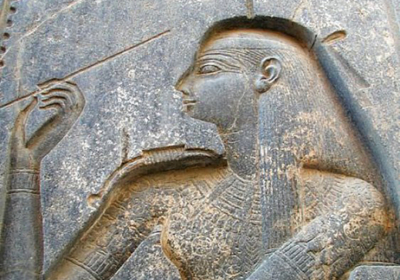 Whether one regards Akhenaten as a hero or villain in Egypt’s history, his elevation of the Aten to supremacy changed not only that nation’s history, but the course of world civilization. To those who came after him in Egypt, however, he was the `heretic king’ and `the enemy’ whose memory needed to be eradicated. His son, Tutankhamun (c.1336-1327 BCE) was given the name Tutankhaten at birth but changed his name upon ascending the throne to reflect his rejection of Atenism and his return of the country to the ways of Amun and the old gods. Tutankhamun’s successors Ay (1327-1323 BCE) and, especially, Horemheb (c. 1320-1292 BCE) tore down the temples and monuments built by Akhenaten to honor his god and had his name, and the names of his immediate successors, stricken from the record. In fact, Akhenaten was unknown in Egyptian history until the discovery of Amarna in the 19th century CE. 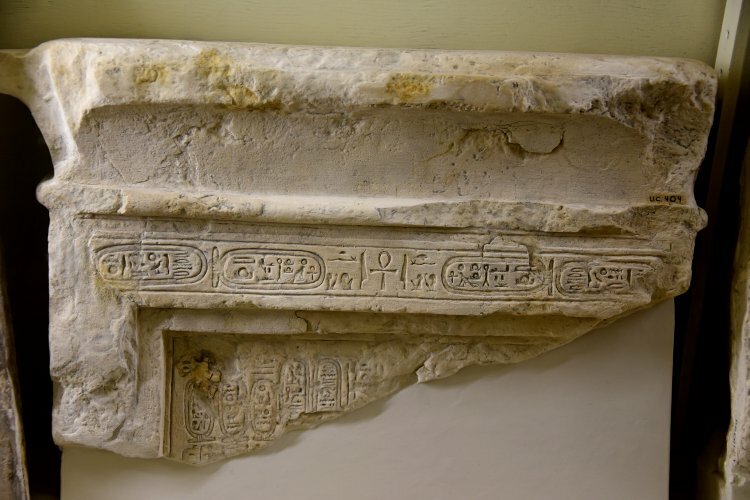 Horemheb’s inscriptions listed himself as the successor to Amenhoptep III and made no mention of the rulers of the Amarna Period. Akhenaten’s tomb was uncovered by the great archaeologist Flinders Petrie in 1907 CE and Tutankhamun’s tomb, more famously, by Howard Carter in 1922 CE. Interest in Tutankhamun spread to the family of the `golden king’ and so attention was brought to bear again on Akhenaten after almost 4,000 years. His legacy of monotheism, however, if Freud and others are correct, influenced other religious thinkers to emulate his ideal of a one, true god and reject the polytheism which had characterized human religious belief for millenia. Source: Ancient History Encyclopedia (ancient.eu), photo: Pinterest.